Welcome to the first lesson in the Use Time Series Data in Python Pandas module. This lesson series covers working with time series data in Python. You will learn how to handle date fields in Python to create custom plots of time series data using matplotlib. In this tutorial, you will learn how to work with the datetime object in Python, which is important for plotting and working with time series data. You will also learn how to work with “no data” values in Python. Import a time series dataset into Python using pandas with dates converted to a datetime object in Python. Describe how you can use the datetime object to create easier-to-read time series plots in Python. Explain the role of “no data” values and how the NA value is used in Python to account for “no data” values. Set a “no data” value for a file when you import it into a pandas dataframe. 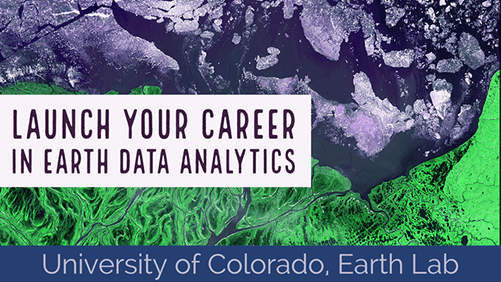 You should have completed the lessons on Setting Up the Conda Environment.. Be sure that you have a subdirectory called data under your earth-analytics directory. Dates can be tricky in any programming language. While you may see a date and recognize it as something that can be quantified and related to time, a computer reads in numbers and characters, and often by default, loads date information as a string (i.e. a set of characters), rather than something that has an order in time. In this lesson, you will learn how to handle dates in Python with pandas using a dataset of daily temperature (maximum) and precipitation in July 2018 for Boulder, CO. Begin by importing the necessary Python packages to set the working directory and download the file. Next, import the data from data/july-2018-temperature-precip.csv into a pandas dataframe and query the data types using the attribute .dtypes. date as object: A string, characters that are in quotes. max_temp as int64 64 bit integer. This is a numeric value that will never contain decimal points. precip as float64 - 64 bit float: This data type accepts data that are a wide variety of numeric formats including decimals (floating point values) and integers. Numeric also accept larger numbers than int will. A pandas dataframe column can only store one data type. This means that a column can not store both numbers and strings. If a column contains a list comprised of all numbers and one character string, then every value in that column will be stored as a string. the program (Python) to minimize the storage size. Python provides a datetime object for storing and working with dates, and you can convert columns in pandas dataframe containing dates and times as strings into datetime objects. Investigate the data type in the date column further to see the data type or class of information it contains. Notice that while you may see this column as a date, Python classifies it as a type str or string. You can easily convert the dates from strings to a datetime object during the import process, which you will see later in the lesson. Once the dates are converted to a datetime object, you can more easily customize the dates on your plot, resulting in a more visually appealing plot. To understand why using datetime objects can help you to create better plots, begin by creating a plot using matplotlib, based on the date column (as a string) and the max_temp column. Plot of precipitation in Boulder, CO without no data values removed. Look closely at the dates on the x-axis. When you plot a string field for the x-axis, Python gets stuck trying to plot the all of the date labels. Each value is read as a string, and it is difficult to try to fit all of those values on the x axis efficiently. an index You will notice that the dataframe prints with that column on the left. Notice that the word “date” which represents the column header, is LOWER than the other two column headings. Also notice that the date no longer appears when you call dtypes. Don’t worry - the column is still there! To plot your data as a bar or scatter plot in matplotlib, you will get an error if you pass a pandas dataframe column of datetime directly into the plot function. This is because when plotting with these methods, numpy is used to concatenate (a fancy word for combine) the array that has been passed in for the x-axis and the array that has been passed in for y-axis. However, numpy cannot concatenate the datetime object with other values. Notice that here you use dataframe.index to access the datetime column. This is because you have assigned your date column to be an index for the dataframe. Also notice that the spacing on the x-axis looks better and that your x-axis date labels are easier to read, as Python knows how to only show incremental values rather than each and every date value. Plot of precipitation with the x-axis dates formated as datetime. Bar plot showing daily precipitation with the x-axis dates cleaned up. NOTE: you do not need to use .values when using a column that contains float objects rather than datetime objects, nor when creating a line graph. However, for consistency, the plot examples above use the same code to employ .values and create the plots. You may have observed that the above plots did not look right. Explore the data further using the describe() dataframe method. Do you see any values that are questionable? # notice any values that may seem off in the summary statistics below? Sometimes data are missing from a file due to errors in collection, inability to record a data point, or other reasons. Imagine a spreadsheet in Microsoft Excel with cells that are blank. If the cells are blank, you don’t know for sure whether those data weren’t collected, or something someone forgot to fill in. To account for data that are missing (not by mistake), you can put a value into those cells that represents “no data”. Often, you’ll find a dataset that uses a specific value for “no data”. In many scientific disciplines, the value -999 is often used to indicate “no data” values. The data in july-2018-temperature-precip.csv contains “no data” values in the precip column using the value -999. If you do not specify that the value -999 is the “no data” value, the values will be imported as real data, which will impact any statistics or calculations run on that column. Now have a look at the summary statistics. And finally, plot the data one last time. Bar plot showing daily precipitation with the x-axis dates cleaned up and no data values removed. By using the na_values parameter, you told Python to ignore those “no data” values when it performs calculations on the data. In this example, the “no data” values are specified to be “NA”, an empty space, or the value 999. Import the data as pandas dataframe indicating the appropriate column for the datetime object. Print the dtypes attribute and create a bar plot of the precipitation data.